Lots of news for this four-page spread, but I have to start on a sad note. Roger and Nicky Boys have had to put Paddy, their West Highland White Terrier, to sleep. He was 16… a good age for a small dog. Paddy enjoyed being with them on all their MG jaunts and he will be missed by his many friends and admirers. Andy Smith, who has owned MGBs since the 1970s, is having a busy year with his 1963 Rally Car. 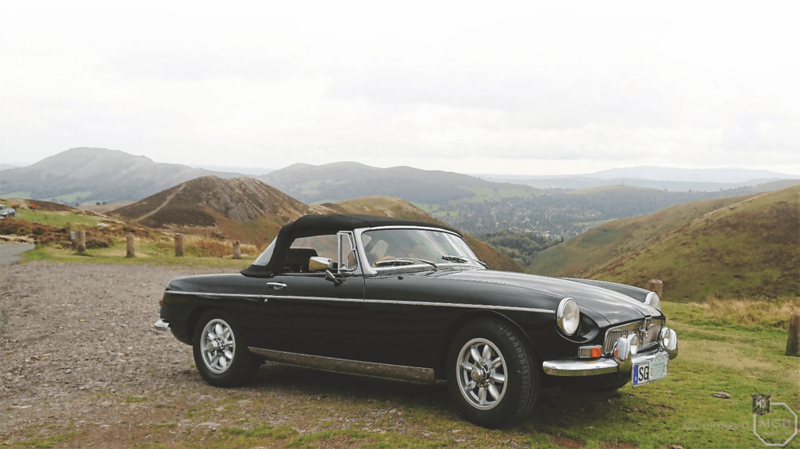 BGS 861A is an ex-California mark 1 MGB which was one of a batch of similar vehicles repatriated by Ron Gammons for the 2,500mile Pirelli Classic Marathon series in 1988. BGS was totally rebuilt from the shell up for use by Malcolm Gammons and Glen Jarvis in the 1989 event. The car performed faultlessly and they took a class win and 15th overall – the best standard car by miles, winning the team award for MG with Stirling Moss and Ron Gammons. In 1990 the car was fully modified to FIA standards, bored out to 1840cc with Webber 45DCOE carburation to provide 130bhp, via a close ratio gear box and Quaife Limited Slip Diff. In this (its current) specification, BGS was driven to seventh place by Rally legend, Roger Clark, with Tony Masson on ‘the clocks’ in the 1990 Pirelli Classic Marathon. 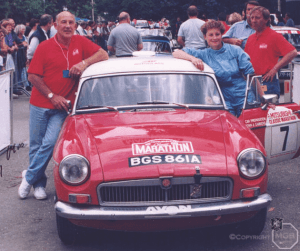 For 1992 it was back to the Classic Marathon, this time sponsored by Mitsubishi, the crew being Sir Stirling Moss and Zoe Heritage. The pair had run a big Healey in the 1991 event but decided to go back to an MGB for 92, Stirling putting BGS through its paces to finish another faultless performance in seventh place. There then followed a 20-plus year period when the car was owned and campaigned by ex-Historic Rally Register Chairman Chris Hunt Cooke who, apart from competing with the car on many Marathon events, went on to win the Clubman’s rally championship in 1996 and 1997, followed by further outright victories in the HRCR classic trophy series in 2002 and 2003. Then came the HERO Le Jog team prize with David Kirkham in the navigator’s seat in 2005, followed by an outright win in this toughest of classic car rallies by coming overall first in the Le Jog Rally of 2007. 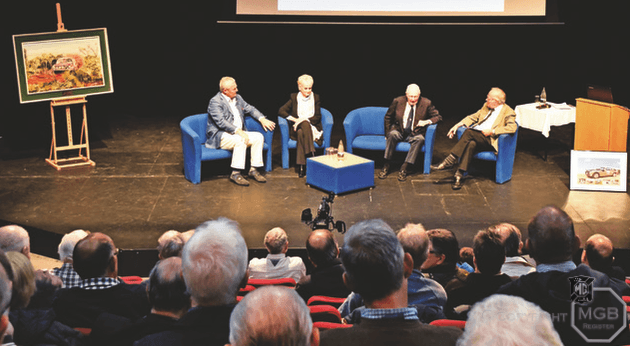 “Keeping up with all this history is an impossibility,” says Andy, who is only too happy to enjoy the experience of driving a Brown and Gammons wellprepared competition car. It’s superbly modified with a tight, well-balanced (Gerry Brown-built) engine and performs well under pressure, coming on cam at 2800rpm and pulling faultlessly all the way to 7000rpm, currently running with a 4.9:1 ratio which provides plenty of punch for hill climb sections of any event. 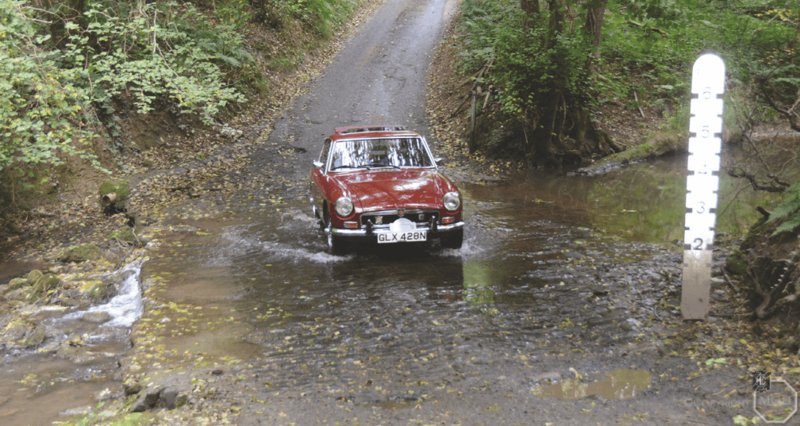 Andy, along with son Nick, has competed with BGS on the Summer Trial, the RAC Rally of the Tests and numerous smaller events since he purchased the car in 2015. This year he has entered and completed the Monte Carlo Classique, a 1,600-mile Goldwinning epic from its Paisley Abbey start at 6.00pm on a snowy night in late January down to the Cote D’Azur, some four days later. That has been followed by the R section of both the Land’s End Trial in March and, most recently, the R section of the Edinburgh Trial. 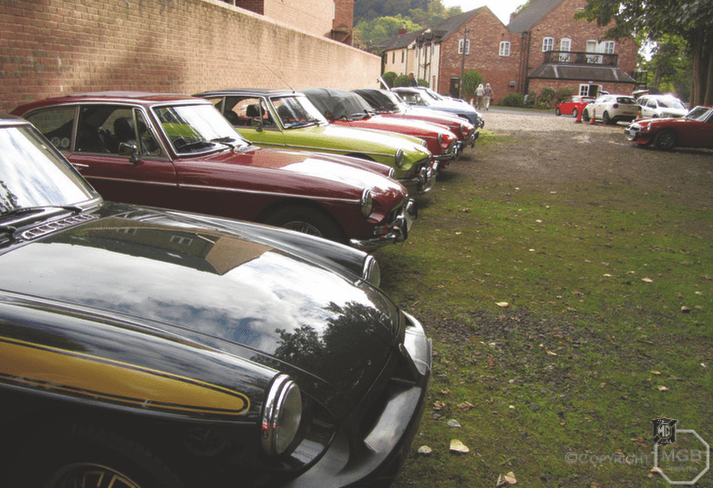 The eagerly awaited MGB Register weekend this year was based in Ironbridge and involved trains, planes and automobiles and lived up to all expectations. 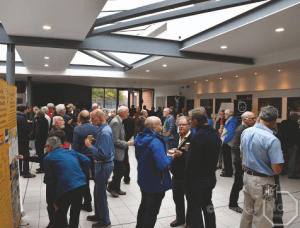 On Friday September 14, 35 of us with MGBs of all ages met up at the Valley Hotel in the heart of Ironbridge for a weekend of catching up with friends old and new, exploring historic Ironbridge and the surrounding countryside. We were greeted with a warm welcome and a pack with details of the weekend’s activities by John and Gill Watson. The pack contained all we needed to know about meal times, and easy-to-follow tulip diagrams of the routes for Saturday and Sunday’s runs. Friday evening we all met for drinks and dinner, after which John gave us an introduction to the varied and interesting things that were planned for the weekend. After a hearty breakfast and armed with our route plan, we left the hotel and drove through Ironbridge past the “Ironbridge” covered in scaffolding and plastic sheeting for conservation work, crossing the gorge and looking for the country lane that would take us to Much Wenlock. The quiet lanes made for a very pleasant drive through small villages to and on through Church Stretton, over a cattle grid and onto the single track road that climbs up the Long Mynd with spectacular views over the valley below. The Long Mynd is open heath and moorland and is designated an Area of Outstanding Natural Beauty. Driving up, it is easy to see why and on the way we pass many sheep that roam freely along with the Welsh mountain ponies introduced to graze and help conserve the heathland. 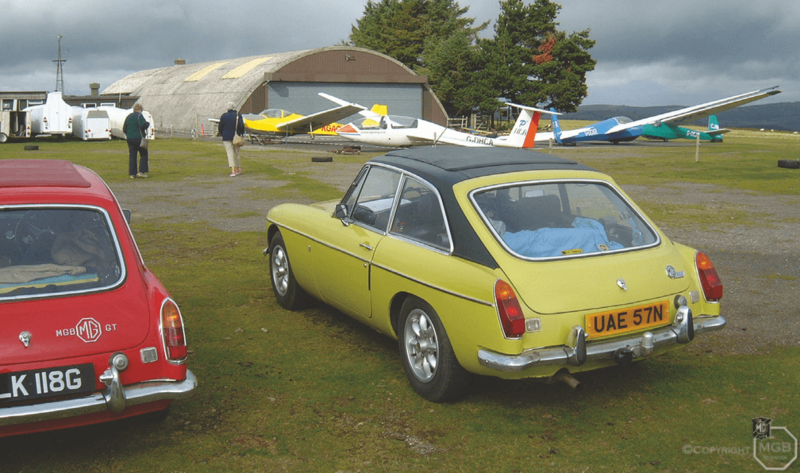 At the windswept peak, some 1,500 feet above sea level, we pulled into the Midland Gliding Club and parked among the gliders and the odd helicopter (now that’s the way to travel). Arrangements had been made for us to join some gliding club members who were waiting for us. We spent an enjoyable half hour having coffee and tea cakes and chatting about gliding and MGs. 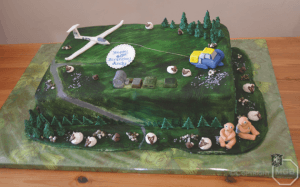 We even disturbed their preparations for a birthday party later that day and were shown a magnificent cake modelling the airfield and gliders. Leaving the gliding club we descended a very steep single track road with more spectacular views across the valley (difficult to envisage bringing the long glider trailers up this road but they do!). As we approached the bottom of the valley there were signs warning us of pheasant out for a stroll along the road and, sure enough, they were. On past Bishops Castle, an old market town, and across the border into Wales and through Montgomery, continuing on quiet country roads to Powys Castle bustling with visitors. Here was another opportunity for tea and cakes, visiting the castle or walking in the extensive gardens. The castle and gardens are owned by the National Trust (always handy to have your cards with you) but the Herbert family who owned the property for over 400 years still own much of the surrounding land and many of the items on display in the castle. On leaving Powys Castle it was time to make our way back to England and Ironbridge, going round Welshpool and onto country roads and lanes, over the Shropshire canal, up a steep climb and on to Minsterley. Time then for some A roads back towards Shrewsbury and Telford, then finally onto B roads, neatly delivering us back at the hotel. Another dry and bright day saw us again driving past the Ironbridge, crossing over the gorge and past yesterday’s turn to Much Wenlock and on towards Broseley. Today’s run would explore the area south of Ironbridge around Bridgnorth and Kidderminster, taking in the Severn Valley Railway and a National Trust property. Leaving Broseley and passing through Bridgnorth onto the B4363, we start looking for an old pub (just an ancient sign swinging in the breeze) down a narrow wooded lane through a ford (mind the pot-holes). Back to civilisation and we are looking for another narrow lane that will lead us to a pub and the Severn Valley Railway Highley Engine House and museum. It is time for a coffee and a look around the museum with its exhibits of a number of their engines, all in working order, including Gordon pulling the night postal sorting carriage and a tank engine pulling a bright orange Highley Mining truck. Over the road to the station and an opportunity for a ride on the trains for those who wished to do so. Leaving the trains behind we travelled round Bewdley and south along country roads to Dunley and a lunch stop for those in need of refreshment. Next, on to Stourport over the river Severn, through the town where the route takes us back towards Bewdley, then north through Habberley and on to Dudmaston Hall (NT) and a cup of tea. Entrance to the Hall is via an apple orchard where each tree has a wooden label hanging from a branch giving the variety of apple and its use. Dudmaston Hall is full of contrasts. Alongside its family history, in part of the house there are Modern Art galleries created by the last owner, Lady Labouchere. After visiting Dudmaston it was main roads to Bridgnorth and Sutton Maddox then country roads through Coalport and back to Ironbridge. At dinner each evening John gathered all the photos we had taken during the day and displayed them on a screen, generating much discussion and seeing what others had discovered. Dinner on Sunday included the traditional raffle, with the money raised this year going to the restoration of Jean Denton’s Marathon MGB. Over the whole weekend Thomas Becks and Ulrike Zollmarsch, who not for the first time travelled from Solingen in Germany to be with us, were busy taking video and photos. Their video of the weekend can be seen via the latest MGB Register eNewsletter. The weekend was extremely well organised and run by John and Gill who deserve huge thanks for all the time and preparation that made the weekend so enjoyable. Thanks also to the Midland Centre colleagues for producing the interesting and varied runs on Saturday and Sunday. Monday morning came all too quickly and it was time to say goodbyes and turn our thoughts to next year’s Register weekend that will be based near Woodbridge in Suffolk, September 13 to 16 2019; perhaps we will see you there. With the MGB Register interest in the London to Sydney Marathon MGB, we thought as it is the 50th anniversary of this 1968 event we would have this as the subject for our 2018 Lecture. John Watson, our MGB Register Chairman, welcomed everyone and explained why we had chosen this subject. We then watched a film showing the Start at Crystal Palace through to Bombay. At this point the motoring journalist Graham Robson was introduced. He then welcomed Rosemary Smith, who had flown over especially from Dublin. Rosemary drove a Lotus Cortina on the event. Then Paddy Hopkirk and Alec Poole were introduced; they should have won the event but stopped to help a driver who was hit by a non-competing car, driven by a police officer. They were driving a BMC-entered 1800 Landcrab, finishing second. We enjoyed a good 40 minutes of Irish banter between them all, with Rosemary telling us how she drove over the Khyber Pass in reverse as she only had two working cylinders, and Paddy commenting that all the girls talked to Alec and not to him. After a short coffee break we watched the cars travel from Perth to Sydney, then our second group of guests were BMC manager, Bill Price, David Harrison who competed in a Lotus Cortina entered by the British Army Motor Association, and Hugh Chambers whose father, Marcus Chambers, was the Comps manager with Rootes Group with the winning Hillman Hunter. Hugh, who was eight years old at the time of the event, explained how shocked his father was when the Hunter won the event. He then told us of his career in Motorsport. His position from November 1 will be the new CEO of the MSA, so we will have a MGB racer at the helm of UK motorsport which will be good for the MGCC. Following the talks, there was an autograph session and those who had purchased a limited edition poster of the Marathon MGB got them signed by all present. We have videoed this event and intend placing it on YouTube shortly – please refer to the MGB Register website for details. We will also if required produce it on a DVD.